The full course fee is $1500. Jim Wyatt is one of three rEvo CCR instructors in the state of Florida. You can purchase your rEvo through Jim and get all your rEvo training and certifications through Jim. Jim is also a CCR Cave instructor, and CCR Trimix instructor through the National Speleological Society-Cave Diving Section (NSS-CDS) and IANTD, should you decide at a later time to become CCR cave or trimix trained. Jim is also certified to teach you how to ride a DPV in the cave environment. The rEvodream is the standard PO2 monitoring device and head's up display which comes on every rEvo unit. It can monitor your choice of one or oxygen cells. Shearwater Research has set the bar for CCR electronics with it's Petrel dive computers and controllers. Shearwater Petrels come in 2 versions on the rEvo - a hardwired version, and a Fischer plug version. The Hardwired Shearwater Petrel has a hardwired cable connection, which cannot be removed. Hardwired connections provide a more reliable interface between the Petrel and the cells. The Fischer cable Shearwater Petrel can be disconnected from the cells, by means of a Fischer connector. This can allow for easy removal of the Petrel from the rebreather itself, for transit, or for stand alone use. The Fischer cable version is only a PO2 monitor and trimix computer, and can never be used as a setpoint controller, or RMS monitor. 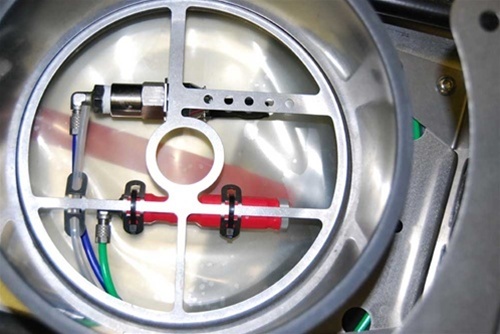 Manual gas addition can be done in one of 2 ways, either through manual addition buttons found on the bottom of the rEvo case, or through a 3-gas addition block. 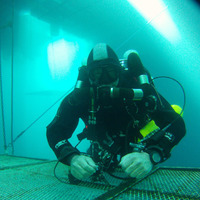 The 3-gas addition block hangs over the diver's chest, and allows for ambidextrous addition of either diluent, oxygen or allows for an offboard gas to be plumbed in. 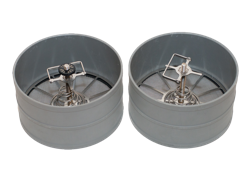 The case mounted manual addition buttons are found on the bottom of the rEvo III Mini and Standard models. Many divers find when thy have a gas addition block, they no longer need or use the case buttons. The case buttons can be removed as a factory option. The rEvo certification program is typically a five day program at minimum standards. Jim requires six-to-seven days for this program. The reason for the extra days is to ensure there is plenty of classroom and in-water time to make you more comfortable diving the rEvo rebreather. (The rEvo crossover program requires three days.) Please feel free to call Jim to discuss why the class is extended for extra days. 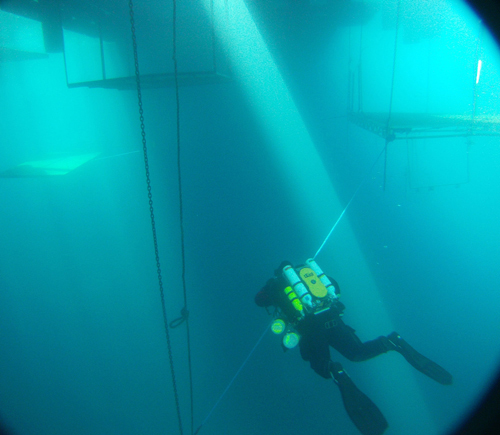 Successful completion of the air diluent course allows the diver to dive to a depth of 120 feet. 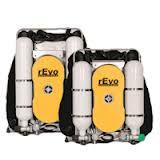 For the brand new rebreather diver we will be discussing in detail the theory of rebreathers, why and how they work. We will discuss some of the history of rebreathers design and some of the early thinking. We will discuss normal operations and failure modes. Jim will make sure you are thinking like a rebreather diver, which is different from an open circuit diver in many aspects. We will build and breakdown the rEvo many times so you will thoroughly understand the way it works, and its advantages over other rebreathers. By the time you complete seven days with Jim you will feel totally confident in your ability to build, breakdown and troubleshoot the rEvo. You will understand and be able to intelligently discuss Constant Mass Flow, you will have a better than average understanding of the way oxygen sensors work and fail, and why they fail and how to know when they are suspect. When you complete this class you will know and understand how to use the Shearwater Predator and the rEvo Dreams. These pieces of electroinic gear are the heart of the rEvo CCR and Jim will make sure you can use these to their maximum potential. Jim is a reltatively new CCR instructor ( Four Years) with about 1000 hours on the unit. Jim remembers vividly the challenges both academically and in the water that came with switching from open circuit to closed circuit and is better able to identify with these difficulties and because of this is better able to relate these personal experiences to you. There are many more experienced CCR instructors out there. There are none that will teach you a more thorough class. Jim does deep cave and technical diving with his rEvo CCR on a regular basis. Jim will not be training you to do deep cave technical diving but will ensure that the habits you develop from day one in the water will better prepare you for the eventuality that you decide to pursue cave and/or technical/CCR trimix diving in the future. Jim will not allow you you to develop habits early on in your CCR training that will have to be 'broken" in the future in the event you pursue more advanced CCR training. Jim will help you configure your gear in a fashion that will facilitate future diving circumstances. Jim will not just allow you to dive it without knowing why each piece of gear is configured. Jim will also insist that YOU participate in that decision making process. The article above entitled Understanding Oxygen Sensors was written by Paul Raymaekers who is the engineer that buids the rEvo. You are strongly encouraged to read this artice carefully. Your knowledge of oxygen sensors as applied too the CCR world will increase immensely and provide you with a solid foundation regarding these sensors, which are the heart and perhaps the soul of a closed circuit rebreather. 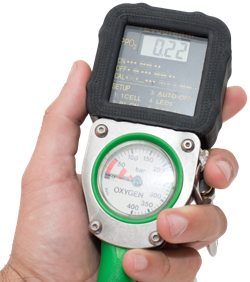 Understanding Constant Mass Flow (CMF) is key to understanding how the rEvo manual unit provides adequate oxygen to the diver while on the CCR. You should read this article and understand the basic concepts of CMF.